Ok, so I may be a day early. I tend to put out some weird ramblings on Wednesdays. What I'm onto is this fireworks nonsense. Nobody wants to live in a war zone. To a dog, especially a fearful one, that is what will be happening a bit after sunset for A While. An Arbitrary amount of time after any given Firework-y event. A couple of weeks if I remember last year. I love looking at them but what that does to anyone that gets "triggered" by them is truly frightening. Yeah, I used the word triggered. Which means those big strong (read: callous types) have just closed this window. Growing up in an area that banned anything more than sparklers, the professional firework displays that shot off on July 4th were amazing. The park near the house, Cooper River Park in Cherry Hill NJ, was a spot you could stand in an open field and watch at least ten displays. Now imagine your idiot Confederate Flag waving, Pickup Truck driving neighbor setting off his personal jollies in the street next door and having them go wild into your hedges and start a fire. Meanwhile your cat or dog is freaking out in mortal terror because someone just dropped a mortar overhead. I would expect this in France in two weeks at Bastille Day, or perhaps in the UK around Guy Fawkes day, but then again Europeans seem to have more sense than some folks around here. Keep your pets indoors tonight. If you need to walk your dog, a possible suggestion is what I am doing. Sunset tonight in Fort Lauderdale, Florida is at 8:17PM. I will try to get my walk started around that time. Preferrably before. "They" always wait until it's fully dark out before the idiots start their own battle of lights. Oh and your cats? First off, if you let your cat out at night, you're doing wrong by them. They live much longer indoors, and so do the songbirds in your neighborhood that are in decline everywhere. Secondly, you never know what some fool will do with fireworks, your cat, and perhaps a little duct tape. Yes, we hear about that every year. Yes, the animal rights laws are getting better. No, your dislike of those facts won't stop some freak from taking out their anger on your pet. They'll be around much longer. Ok, so I didn't mean for this to get so strident and rant-y. 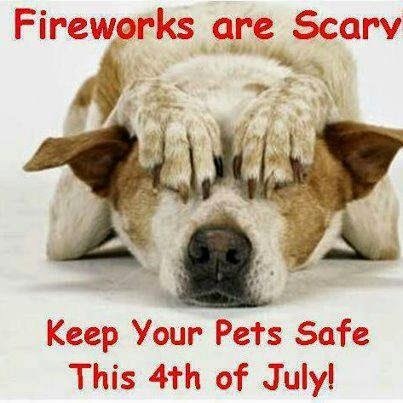 Protect the pets you love. Make sure you have a picture of them with you. If you lose yours, look for them at the shelter. 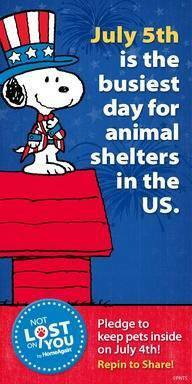 Like that graphic above says, the 5th of July is the busiest day for animal shelters with people trying to recover their lost dog or cat. Their welfare is in your hands. If you happen to know a veteran, ask them if they need company tonight. They may appreciate it. Ok, let me rephrase it. If you know of anyone who may be alone tonight or any night, go say hi. They may appreciate it.